New York, NY - September 22, 2017 - Friday evening at the Rolex Central Park Horse Show (RCPHS) in Wollman Rink featured two world-class show jumping competitions, as Kent Farrington (USA) and Creedance took top honors in the U.S. Open $216,000 Grand Prix CSI 3* presented by Rolex and a win for Jennifer Gates of Seattle, WA, who guided Alex to victory in the U.S. Open $25,000 Hollow Creek Farm U25 Grand Prix. 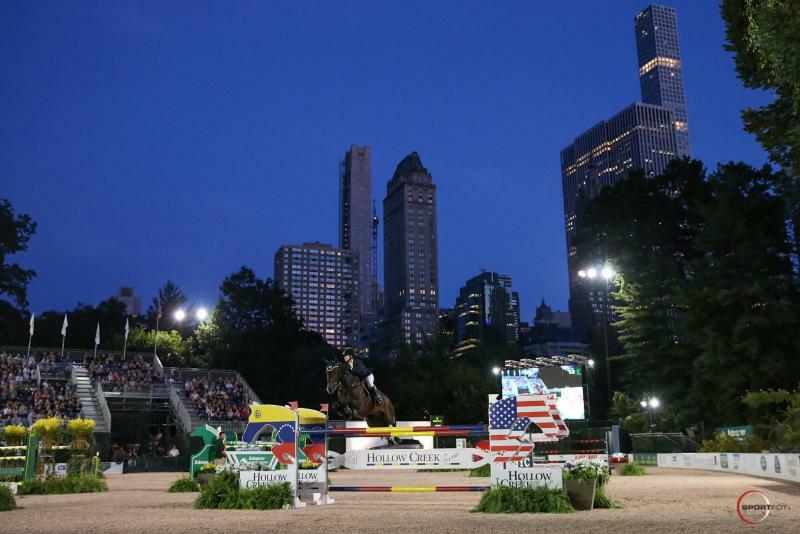 Tonight's competition marked the third day of national and international competition showcasing top equestrians from around the world in the heart of New York City. 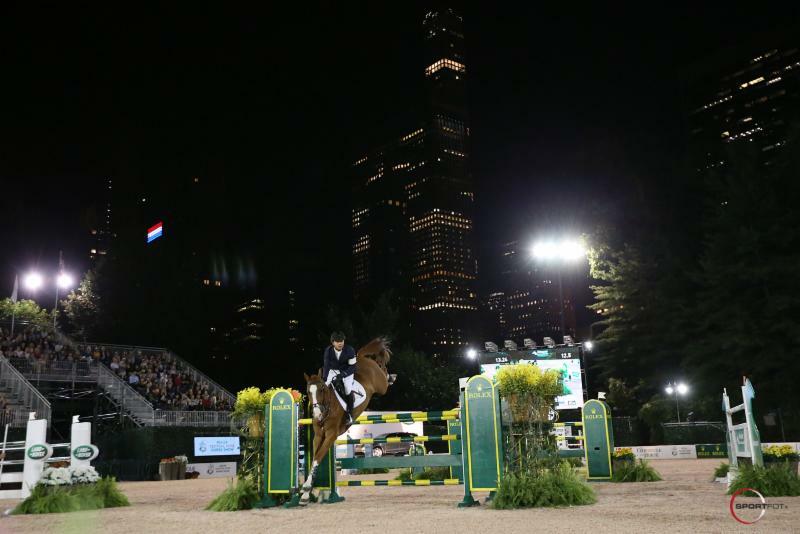 The Rolex Central Park Horse Show runs through Sunday, September 24, with four days of multi-discipline equestrian sport for Arabians, jumpers, arena eventing, and hunters. 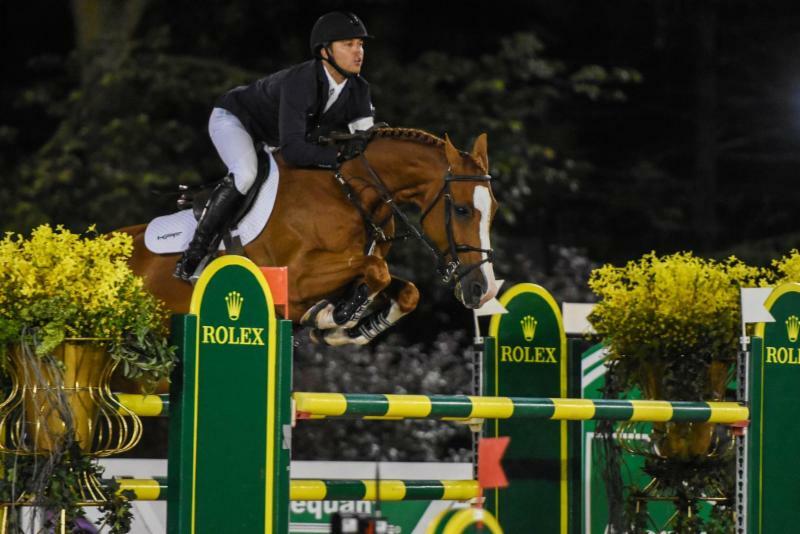 Kent Farrington (USA) made an impressive jump to the top of the leaderboard in the $216,000 Grand Prix CSI 3* presented by Rolex, topping the class aboard his vigilant mount Creedance to take his first ever win in the main event at the Rolex Central Park Horse Show. Currently ranked number one on the FEI World Ranking List, Farrington solidified his knack for victory today, besting a competitive class of 27 entries. Hardin Towell (USA) and Lucifer V, winners of last night's $40,000 CSX FEI Speed Class, finished in second place with a jump-off time of 37.58 seconds, ahead of Kristen Vanderveen (USA) and Bull Run's Faustino De Tili, who also captured third in yesterday's speed class, capping the top three placings tonight with a jump-off time of 37.70. The pair navigated the track set by Guilherme Jorge (BRA), which saw nine entries move to the second and final phase of competition, while Farrington, the second to last rider in the jump-off, sealed the win with a masterful round aboard the 2007 Dutch Warmblood gelding (Lord Z x Camantha) owned by Farrington and R.C.G. Farm. "This is a very special venue, and it's very impressive for the horses. Warming up in the back of the park and walking up here, some of them are a bit star struck, so luckily we have a very good course designer who built a fair course for us. That's why you saw a fair amount clear, and then it was a competition of speed. We had some very competitive riders in there and I'm happy to get out of here with a win." Farrington touted Towell as a tough competitor who is difficult to beat in pressure situations. Unable to watch Towell's trip aboard Lucifer V, Farrington noted that in order to win the class, he knew he would have to make up time at the beginning of the course, and pushed Creedance to a paced start and a finessed finish. 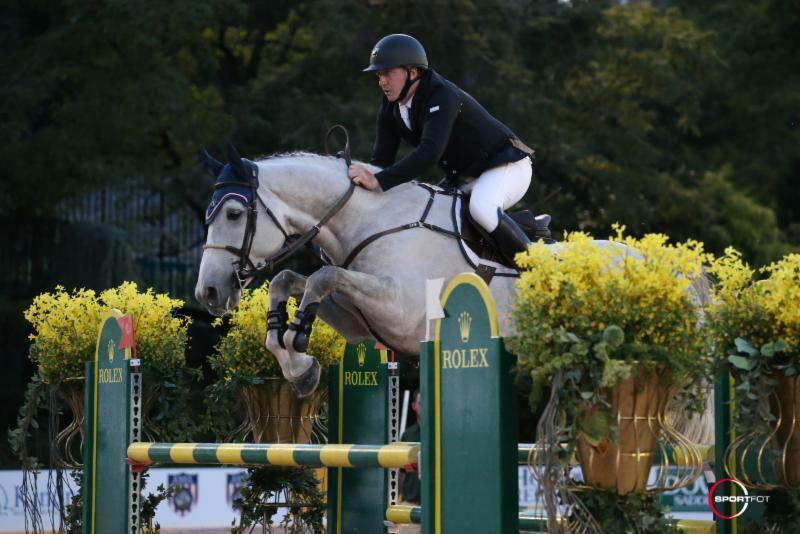 Kent Farrington and Creedance race to victory in the jump-off of the $216,000 Grand Prix CSI 3* presented by Rolex. "I watch Hardin ride a lot because he's in Europe competing with the best riders in the world. He's very competitive and very fast. I actually didn't see him go tonight but they told me he had a very quick round. With this particular horse I try to have my own plan because he's very fast and I have to play to his strengths, so I tried to make it up early in the course and then slow him down a little bit to the last fence, because sometimes he can get running too fast, and knock it down. My strategy today was to win it early and be able to ease off at the end." Speaking to his successful relationship with Creedance, Farrington noted that he has spent time understanding and perfecting the gelding's management and training schedule in order to keep him calm and focused in the competition arena. He explained, "I've had this horse since he was seven years old, so for a bit of time. He's always been really high energy and very competitive, so it's more a matter of managing his energy and keeping his focus. He's only ten years old, and already he's got a lot of victories under his belt, and I think he has a big future in the sport." Shortly before the start of the class, Farrington quietly announced that if he were to amass any earnings in the evening's featured class, he would donate the entirety to hurricane relief, aiding victims of both Hurricane Harvey and Hurricane Irma. Ultimately taking the lion share of the winnings, Farrington's philanthropic and charitable act will donate nearly $71,000 to Direct Relief, a humanitarian medical relief and aid non-profit aimed to help individuals impacted by natural disasters. "I'm a resident of Florida. A lot of us actually have houses and stables there and my mom lives there. She had to relocate to New York to stay with my sister avoiding the hurricane and we were lucky. We dodged a bullet, and it went to the other side of the state, but it was a reality check," explained Farrington. "We were lucky to get away without much damage, but a lot of people weren't as fortunate. I just felt like it was the right thing to do. I feel very lucky to be living my dream, traveling the world and competing for big money, and this event is all about showcasing our sport, so I thought it would be a good opportunity to do something for people who could use it." 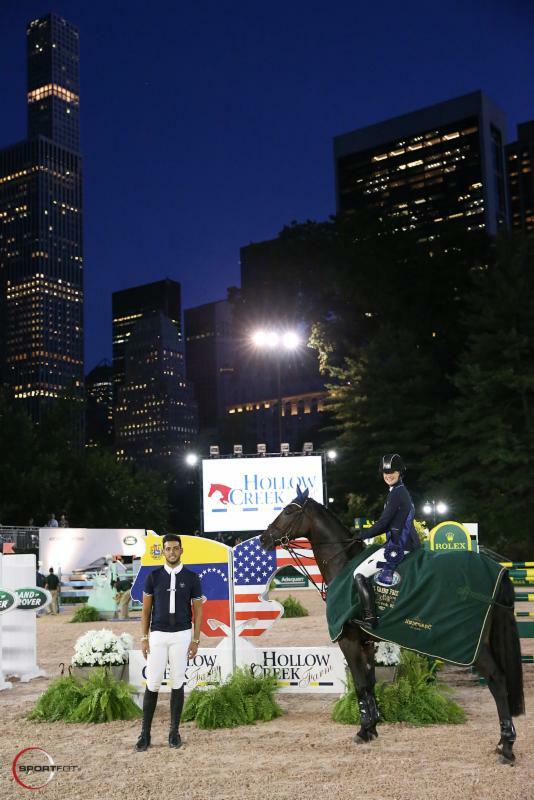 Hardin Towell (USA) concluded a banner week in Central Park, taking the win in yesterday's featured FEI event, before capturing second place this evening and earning the U.S. Open Leading Rider Award. As he discussed the pair's strategy for the course, Towell noted that Lucifer's consistency has become one of his greatest strengths. "He felt great and he had a great first round. I actually did a little bit the opposite of Kent. My horse's strength is long gallops, and in the beginning [of the course] last year I gave this class away, I felt, because I tried to be too quick to the Rolex double, and it was a vertical to an oxer and I had the vertical down," he said, reminiscing on last year's class. "I told myself I would take a little more time there and be quick to the last couple, so when they had the split afterwards where Kent was six-tenths of a second up on me, I knew it would be close because I know his horse quite well too. I knew he would take it easy at the last and not be quite as quick, so we both had our plan. We know our horses and we stuck to it. Tonight was his night." Third place honors were bestowed upon Kristen Vanderveen (USA) and her mount Bull Run's Faustino De Tili, another top-three finisher in both FEI classes this week at RCPHS. Vanderveen has earned numerous wins in the past two years and found herself once again on the podium. Commenting on both of her rounds, Vanderveen explained that she planned to jump more conservatively in the second round to not incur an additional four faults, as she did in yesterday's speed competition. "I also had a quick round yesterday and like Hardin was saying, sometimes it's hard for the horses to do that quick round and come back today," elaborated Vanderveen. "My plan in the jump-off was actually to be a little bit conservative and not rush him too much because I did yesterday and paid a penalty for it. Today I tried to take a little bit of a breath and also paid for it a little bit. Now I'll find the happy medium ground." 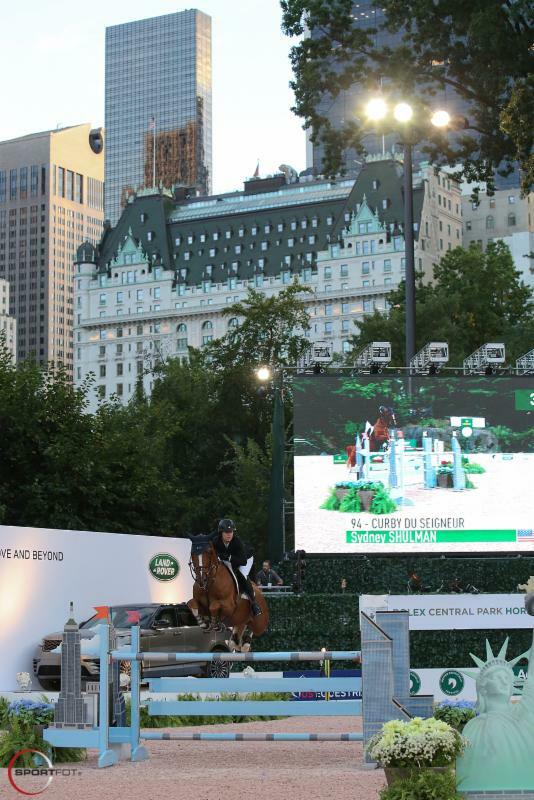 In its fourth year of competition, the Rolex Central Park Horse Show has become an iconic fixture for equestrians and horse enthusiasts alike, bringing the best of the best to Manhattan and providing a growing platform of exposure for equestrian sport. Mark Bellissimo, CEO of International Equestrian Group (IEG), discussed the detailed planning and operational logistics of the behind-the-scenes work conducted pre, during, and post show, and hopes that the event continues to grow beyond its current reach. "First of all, what a great competition tonight. For Kent to give his money away to charity is just a great testament to his character, and the character of his contributions to the sport," said Bellissimo. "This event is dear to us, to Katherine and I, and Michael Stone, Vaneli Bojkova, and Paul Regal, who have been champions of this, taking a very difficult venue and being able to put together something I think has been very, very special. This was an attempt to bring back the magic of what was the National Horse Show in Madison Square Garden, and that has always been considered the gold standard for shows, which I don't think it has ever been matched in many ways." 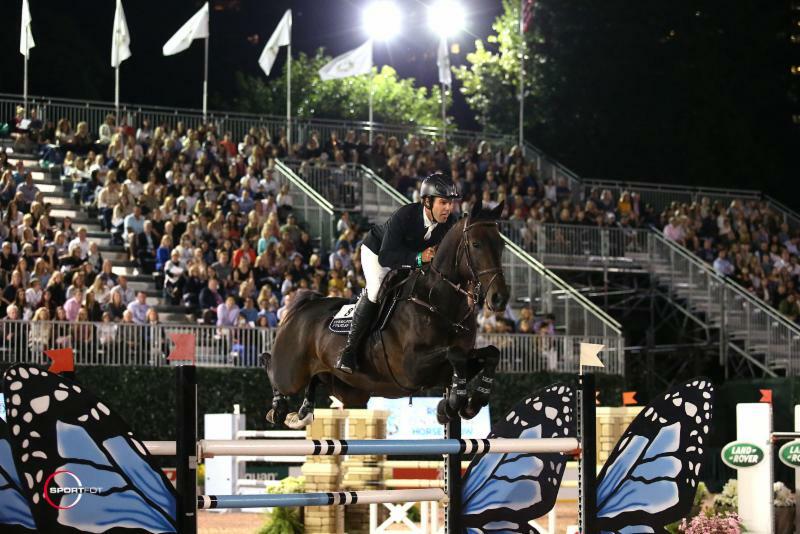 Bellissimo continued as he addressed the importance the venue provides both riders and spectators as the singular equestrian competition hosted in New York City each year. "Obviously, it's a small venue, so where we don't pick up great masses of crowds like Madison Square Garden. The bottom line is that we'll be getting about 640 million impressions for this event and I don't think there's any event in the United States that gets that much energy and action around it," he added. The top three riders enjoy a celebratory champagne spray after their presentation ceremony. Murray Kessler, President of the United States Equestrian Federation, was also on hand to discuss the expansion of the show and the benefits the United States' equestrian governing body experiences through the interaction and association with the competition in the heart of New York City. "First, I want to echo what Mark said. Kent, what compassion and generosity. We've done nothing at the US Equestrian Federation for the past weeks but deal with hardship on the islands and in Houston and then in Florida, and the entire USEF membership has poured their hearts out trying to help, but this was a great act of compassion and generosity," said Kessler. "Mark and his team are the largest and most innovative organizers we have in the United States, by far. They keep pushing the envelope and growing the sport, and this is a testament to that. Our vision and mission is to bring the joy of horse sport to as many people as possible, and how could you do better than being in the heart of Manhattan?" To conclude, Bellissimo honored the many sponsors and participants who make the competition's annual return possible. He commented, "We have a tremendous amount of sponsors here and the energy of the show is really interesting. It's building momentum. The more we can get sponsors into the sport, the more we can make the sport successful long-term for the athletes, and tonight was probably one of my favorite nights that we've had in terms of weather, competition, and atmosphere of the show." 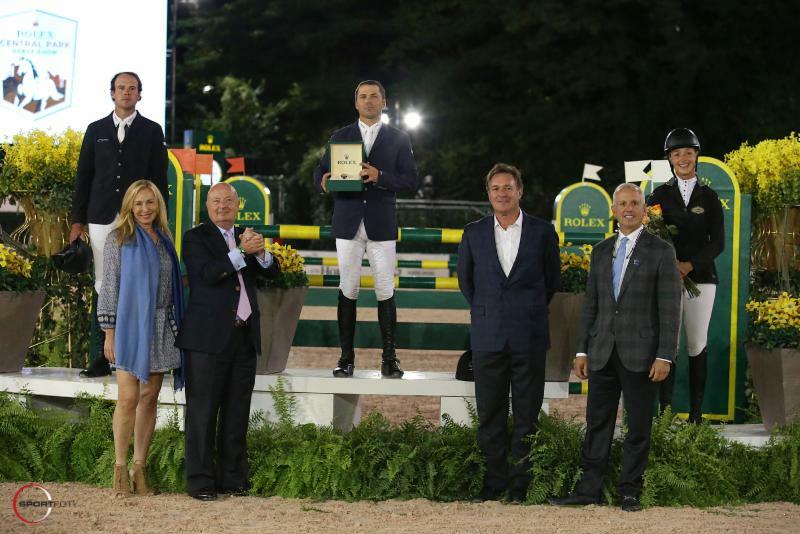 "I also want to thank everyone who put all this together, especially Rolex. 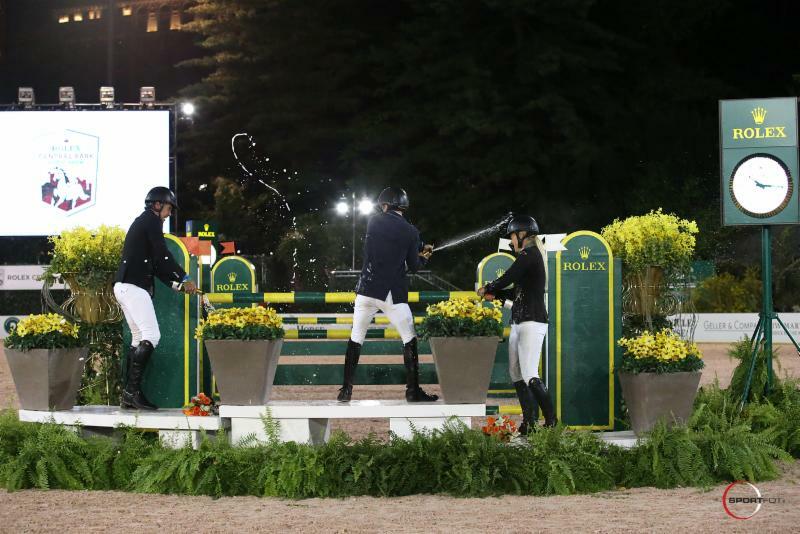 Rolex has been a tremendous supporter of the sport and this event. When we first approached Rolex about this [show], it was a hockey rink. They don't put their brand on things easily, so for them to have confidence in us as an organization, to support this and call it the Rolex Central Park Horse Show is a great testament and we appreciate their contribution to that effort. I think this event will continue to grow in stature, and it's our goal to turn it into a CSI 5* over time. We're hopeful we can make that transition and turn Central Park into one of the great CSI 5* events on the tour with Rolex as our partner." The U.S. Open $25,000 Hollow Creek Farm Under 25 Grand Prix captivated spectators to begin competition on Friday evening at the 2017 Rolex Central Park Horse Show and saw a speedy double clear victory for Jennifer Gates of Seattle, WA, and Alex, a 2004 Westphalian gelding (Arpeggio x Marilu) owned by Copernicus Stables LLC. The pair bested the class of 13 entries with a jump-off of 27.14 seconds. "I thought that the first round was really well done," commented Gates. "I was really happy with it. I thought Alex helped me out a bit in the first round, so I was really lucky to come in with him for the jump-off and be able to go that fast. I was trying to just come out and go as fast as I could, so I'm really happy with his performance tonight." The pair have been together since this past July, and this is Gates' fourth show with her new mount. She explained, "I was very lucky to get the ride on this horse. He's one of the coolest ones I've gotten to ride. He just goes into that ring and does his job. He's such a sweetheart in the barn. I'm hoping to grow our partnership and work on being a bit faster." Sydney Shulman of Greenwich, CT, and Curby Du Seigneur, a 2008 Belgian Warmblood gelding (Dore Van't Zorgvliet x Victoria Du Seigneur), owned by Hannah Patten, followed in second place, crossing through the timers less than a second behind Gates to jump a clear final round in 28.08 seconds. Shulman has been training the gelding with owner Hannah Patten, but picked up the ride on him recently as a competition mount. "Curby is a relatively new ride for me," said Shulman. "I've seen this horse do some pretty amazing things with his owner, so I was feeling a little brave into the double. I think Jen beat me to number five. She caught a really good one there and I added an extra stride." Schulman joked, "Jen and I were talking earlier, and her horse's one stride is my horse's six. She definitely beat me there!" Third place honors went to Jordan Coyle (IRL), and Chuckles, a 2008 Belgian Warmblood gelding (Cicero Z x Viola) owned by Andrew Kocher, navigating the short track in 26.98 seconds. "This horse is very new to me. I've only been riding him for about five weeks now. I'm very grateful to Andy [Kocher] for letting me take the ride on him," he said. Jennifer Gates and Alex in their presentation ceremony with Emanuel Andrade of Hollow Creek Farm. Coyle is new to competing in the United States and has only been riding stateside since May. Moving forward, Coyle plans to compete Chuckles in Harrisburg, PA, before mapping out a competition plan for the pair in Wellington, FL. Competition at the 2017 Rolex Central Park Horse Show continues tomorrow featuring an array of hunter classes beginning at 1:30 p.m. ahead of the U.S. Open $50,000 Arena Eventing presented by The Fite Group Luxury Homes at 8:00 p.m. To learn more about the Rolex Central Park Horse Show, please visit www.centralparkhorseshow.com. Dog agility demonstrations, America's Got Talent Finalists The Pompeyo Family exhibition, Land Rover "Kids' Adventure Course," Hobby Horse courses, pony rides, candy stations, face painting, equine grooming and learning stations and more! Gates open 12:00 p.m. - 3:00 p.m.
A portion of ticket sales will benefit a lengthy list of New York, as well as equestrian based charities. www.centralparkhorseshow.com or on Facebook at www.facebook.com/CPhorseshow and follow @cphorseshow on Twitter and Instagram. Photo Credit ©Sportfot & MegBanks/RCPHS. These photos may only be used once in relation to this press release with proper credit.